- move in horizontal direction while your hand is vertical. - move in vertical direction while your hand is horizontal. - move in horizontal direction with 2 hands making a 'zooming' gesture. You can adjust the sensitivity and the scroll/movement speeds by adjusting the trackbars. You will need to experiment a bit to find the ideal settings. While developing this program most effort was made to minimize the load on your cpu so that it can even be run on low powered netbooks and does not affect other programs that much. This is a major difference with other cam tracking software (like camspace, face track etc), they are using way to much cpu power! 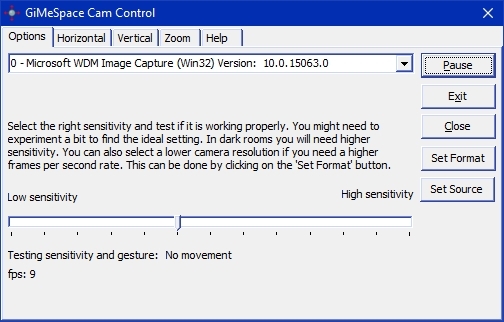 GiMeSpace Cam Control uses about 4% load on a 2Ghz dual core and about 15% on a 1.6Ghz single core netbook.